South Bend, IN. 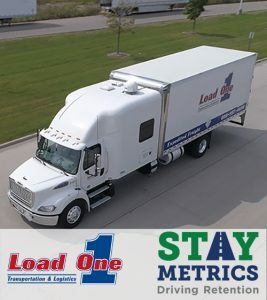 December 3, 2018 — Stay Metrics, the leading provider of evidence-based driver feedback, engagement, training, and retention solutions, announces a new case study on its partnership with Load One, LLC. The case study is the first in a new series about industry-leading motor carriers that have achieved breakthrough results for driver retention. This story is available to anyone at no cost on the Stay Metrics website. Load One began using the annual Driver Survey from Stay Metrics to gather driver feedback and opinions. It also focused on the experiences of newer drivers using the orientation survey, typically given after a week on the job, and the early driver experience survey, most often taken between 6-8 weeks after orientation. The data-driven surveys led Load One to make numerous changes that ultimately resulted in a decrease of early-stage (first 90 days) turnover from 51.3 percent to 39.4 percent in the first year of the program. Load One also launched an online Gold Rewards program using an innovative platform from Stay Metrics that allows drivers to earn and redeem points from a myriad of categories that include job performance and tenure. The rewards website also serves as a hub for Load One to share company news and for drivers to access training resources. Early driver turnover for Load One continued to improve, reaching 36.4 percent in the fifth year of the partnership. In 2017, Load One further improved the work experience of drivers with Drive First, a complete onboarding platform from Stay Metrics with digital employment forms, driver training modules, and assessments. Between September 2016 and September 2018, the company’s trailing 12-month annual turnover dropped to 25.8 percent from 74.3 percent. In contrast, the average annualized turnover of large carriers reported by the American Trucking Associations increased to 98 percent in Q2 2018. Stay Metrics’ industry-leading suite of driver-lifecycle feedback interviews and surveys, combined with advanced data analytics, helps carriers understand driver behaviors and attitudes related to driver retention. Stay Metrics offers a unique custom-branded loyalty rewards program to recognize driver performance on key metrics. The engagement platform also serves as a communication and resources hub for drivers, in addition to supporting DRIVE SAFE and DRIVE FIT training modules.